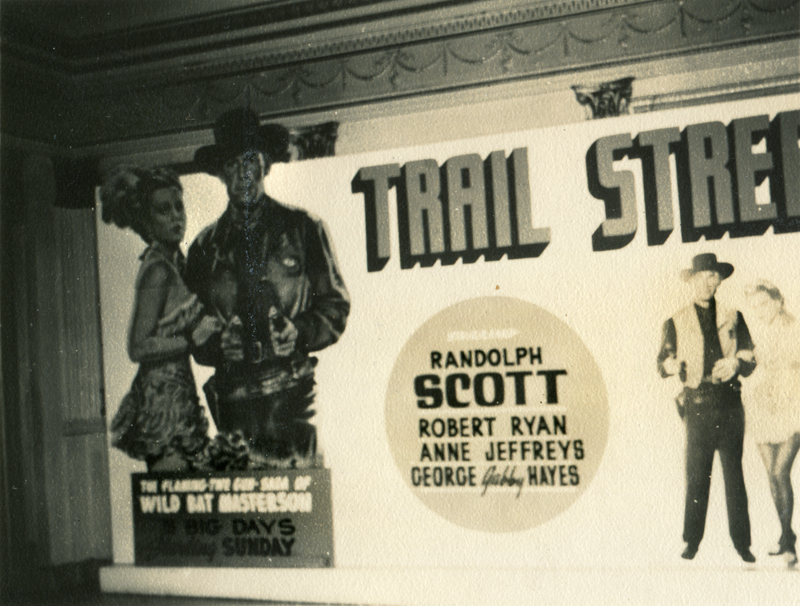 Randolph Scott in "Trail Street"
Personal photograph (4"x3", matte finish, origin unknown) of a billboard-sized sign in an unidentified location, advertising the 1947 RKO Radio Picture, "Trail Street," partially filmed at the Jauregui Ranch in Placerita Canyon. Randolph Scott stars as Bat Masterson, who is hired as sheriff to clean up the town of Liberty, Kansas. Credited cast includes Robert Ryan, Anne Jeffreys, George "Gabby" Hayes, Madge Meredith, Steve Brodie, Billy House, Virginia Sale, Harry Woods, Phil Warren, Harry Harvey and Jason Robards Sr.
LW2436: 9600 dpi jpeg from original print purchased 2013 by Leon Worden.